In 1930 miners began to scrape the land in Peru to find the gold hidden underneath. Today over 30,000 small-scale miners work in the Amazonian area which is one of the most diverse and environmentally rich areas in the world. Gold mining in Peru began with miners armed with picks and shovels digging up riverbanks and now include huge motorized diggers and mining trucks looking for gold deposits. Peru is listed as the largest gold producer in South America, but almost 20 percent of Peru’s gold bullion is mined illegally with techniques that destroy forests and pollute rives. The government in Peru is trying to require gold mining in Peru to be registered and claims formalized. Specific areas are set aside for mining and gold mining claims for sale must be legitimized. Government officials are stepping up efforts to find illegal gold mining claims, but area miners still return to unregistered claims. 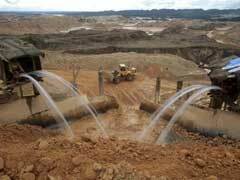 Gold mining supplies for gold mining in Peru includes combining mercury with gold sediments. Miners use their feet to mix mercury with soils to form an amalgam of the two metals. The amalgam is heated in large skillets over open fires to cook off the mercury but retain the gold. Mercury accumulates in streams and rivers, gets in the sediment and fish. Unhealthy levels of mercury is causing cancers, brain and kidney damage. Mercury poisoning is now becoming epidemic in Peru. The second largest gold mine in the world is Yanacocha gold mine and covers 535 square miles, is an open pit mine, and annually produces over three million ounces of gold. This mine is currently one of the biggest environmental polluters and destroyer of natural waterways in the world and is currently the subject of law suits in Colorado, United States. Newmont Gold, who owns Yanacocha, is still one of the best gold mining stocks to own despite its legal battles. Gold mining in Peru would not be complete without mentioning the legendary lost city of gold, El Dorado that was the goal of Spanish conquistadors in the early 1700s. Lost gold mines are thought to be in the rugged mountains of Peru and today the Andean Mountains represent a vast undiscovered wealth of gold with modern day explores and mining companies converging on the region seeking high stashes of gold. Geological studies do indicate that there are high reserves of both gold and iron ore completing the legends of vast gold reserves in Peru.